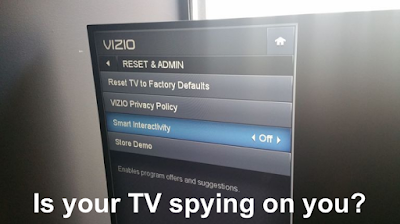 Internet-connected smart TVs and streaming devices from Vizio, LG, Samsung, Sony, Roku, Google and others can all spy on your viewing habits. Here's how to stop them. When you unpacked your new TV or streamer for the first time, you probably couldn't wait to start watching it. In the excitement to put it through its paces, chances are you just clicked "I agree" to all those screens of legal mumbo jumbo that came up during the setup process. Did you know one of the things you likely agreed to was allowing your TV to track your viewing habits and send the information to advertisers and other third parties? The same could go for your streaming device. Vizio was recently slapped with a $2.2 million fine by the FTC for failing to properly disclose how it shares its tracking information, and in previous years Samsung and LG have both faced similar scrutiny. Streamers from Roku, Apple, Amazon and Google haven't made any major privacy missteps yet, but their policies are generally less intrusive than those of TVs. What kind of data do TVs and streamers collect? Information about what you watch, which apps you use and other activity on your smart TV or streamer is valuable to advertisers and other third parties, as well as the manufacturers themselves. They use it to target ads and fine-tune viewing suggestions, among other things. Of course, similar usage data is also collected by phones, PCs and other devices, as well as many apps you use and web pages you visit. Now that you know your TV or streamer could be tracking you, perhaps you want to go back and turn that tracking off. Read David Katzmaier's article at https://www.cnet.com/how-to/your-tv-is-probably-tracking-you-heres-how-to-stop-it/ to learn how.